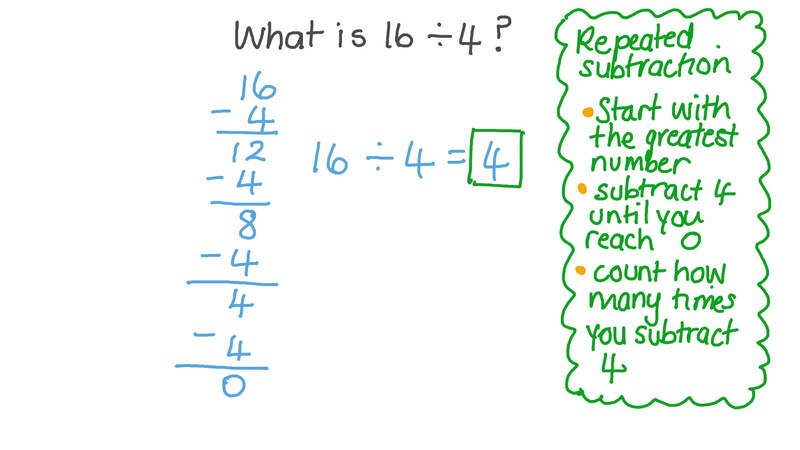 In this lesson, we will learn how to divide using the repeated subtraction process to find the quotient and remainder. A person wants to distribute 30 notebooks equally into 6 bags. How many notebooks should they put in each bag? 18 friends want to play volleyball. If they divide into teams of 6 people, how many teams will there be? What is 1 6 ÷ 4 ? A person has 12 apples to put in plates. Each plate will hold 4 apples. Start at 36 and jump back in 6 s until you reach 0 to find the answer to 3 6 ÷ 6 . Use Samar’s strategy to find the answers. 2 0 ÷ 4 = ? 2 1 ÷ 7 = ? We can use number lines to divide. Jump back 5 each time. How many jumps from 35 to 0 do you make? Write a subtraction equation to show this. What is 3 5 ÷ 5 ? 36 friends want to play volleyball. If they divide into teams of 6 people, how many teams will there be?